doTERRA oils can be used for a large variety of reasons – not just aromatherapy. From recipes to cleaning products to body scrubs and more, essential oils provide endless options for use. Keep reading to learn more about cooking and cleaning with doTERRA products and how these oils can be a part of your everyday routine. doTERRA oils can add exuberant flavour to any dish or dessert. You’ll often find plenty of use for peppermint, lavender, ginger, orange and lemon in desserts and chocolates, while thyme and marjoram are common in stews and savoury dishes. Be sure to follow these helpful tips and tricks for baking with essential oils. Cinnamon Apple Cake – it’s healthy, too! 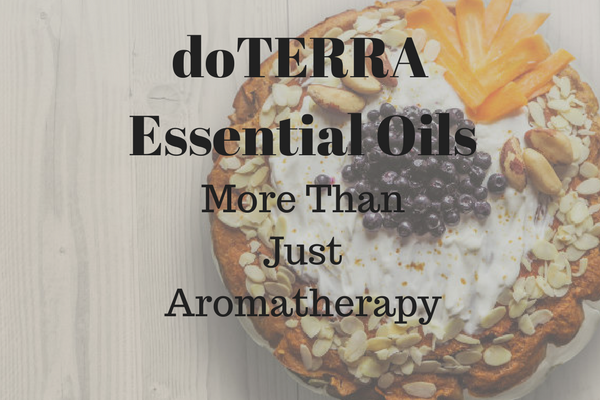 For a complete list of doTERRA recipes, check out their recipe blog here. It might be time for a spring clean of your home so why not avoid buying those chemical-smelling cleaning products and make your own at home? Many of the products in your cupboards are natural cleaning agents, so you can simply add a few drops of doTERRA oils and be on your way to a delicious and clean smelling home. If you’re looking for a multi-purpose, powder cleanser, try this easy-to-make recipe. Add a few drops of lemon oil and you’ll never buy a store product again. Or if you’re searching for a DIY dish soap, you’ll love the combination of lime, lemon and Citrus Bliss oils that’s tough on grease and gentle on your hands. My favourite spray cleanser that I use regularly on my fridge and microwave is a simple formula of white vinegar, hot water and doTERRA’s lemon oil. It smells fresh and delicious and cleans just as well as any multi-purpose spray you’d buy at your local grocery store. doTERRA Essential Oils offer endless opportunities for your health and home. Read more about the different uses and how you can incorporate these oils into your everyday life. If you’d like to know more, send me a message online or call me at 250-830-3285.